dhivya prabandham – upadhEsa raththina mAlai – pAsuram 9 – http://divyaprabandham.koyil.org/index.php/2015/12/upadhesa-raththina-malai-9/ – English translation by raghurAm swamy. Full series at http://divyaprabandham.koyil.org/index.php/2015/11/upadhesa-raththina-malai/ . upadhEsa raththina mAlai – pAsuram 8 – http://divyaprabandham.koyil.org/index.php/2015/12/upadhesa-raththina-malai-8/ – English translation by raghurAm swamy. Full series at http://divyaprabandham.koyil.org/index.php/2015/11/upadhesa-raththina-malai/ . SrI dhEvarAja ashtakam – SlOkams – English translation by vangIpuram satakOpan swamy – http://divyaprabandham.koyil.org/index.php/2015/12/sri-dhevaraja-ashtakam-slokams/ based on http://divyaprabandham.koyil.org/index.php/2015/12/sri-dhevaraja-ashtakam-tamil-slokams/ . Full series can be viewed at http://divyaprabandham.koyil.org/index.php/2015/12/sri-dhevaraja-ashtakam/ and http://divyaprabandham.koyil.org/index.php/2015/12/sri-dhevaraja-ashtakam-tamil/ . Audio rendering of this prabandham can be listened at http://divyaprabandham.koyil.org/index.php/2015/12/sri-dhevaraja-ashtakam-audio/ . pramEya sAram – More articles published by vEnkatEsh swamy in thamizh – http://divyaprabandham.koyil.org/index.php/2015/12/prameya-saram-tamil/ and in English – http://divyaprabandham.koyil.org/index.php/2015/12/prameya-saram/ . srIvaishNava granthams – charamOpAya nirNayam – uththAraka AchAryas – https://srivaishnavagranthamstelugu.wordpress.com/2015/12/09/uththaraka-acharyas/ based on http://ponnadi.blogspot.in/2012/12/charamopaya-nirnayam-uththaraka-acharyas.html – telugu translation (new article) by srInivAsa rAmAnuja swamy. Full series can be viewed at https://srivaishnavagranthamstelugu.wordpress.com/charamopaya-nirnayam/ . upadhEsa raththina mAlai – pAsuram 7 – http://divyaprabandham.koyil.org/index.php/2015/12/upadhesa-raththina-malai-7/ – English translation by raghurAm swamy. Full series at http://divyaprabandham.koyil.org/index.php/2015/11/upadhesa-raththina-malai/ . pramEya sAram – Commencement of English/Hindi translation – based on simple explanation in thamizh by SrI u vE V K SrInivAsAchAryar swamy which was based on maNavALa mAmunigaL’s detailed commentary. This was originally published in SrI rAmAnuja dharSanam e-magazine (http://www.varavaramuni.com/home/sriramanuja-dharsanam-magazine). thamizh – http://divyaprabandham.koyil.org/index.php/2015/12/prameya-saram-tamil/ . thaniyan, introduction and 2 pAsurams are also uploaded. Hindi – http://divyaprabandham.koyil.org/index.php/2015/12/prameya-saram-hindi/ – Translation by kESav randad swamy. srI rAmAnuja dharsanam – e-magazine – December/kArthigai – thamizh Issue recently released and can be viewed at http://www.varavaramuni.com/home/sriramanuja-dharsanam-magazine/thamizh . gIthArtha sangraham – Section 8 – http://githa.koyil.org/index.php/githartha-sangraham-8/ . Full series can be viewed at http://githa.koyil.org/index.php/githartha-sangraham/ . Also, full rendering and individual SlOkams audio can be listened from http://githa.koyil.org/index.php/githartha-sangraham-audio/ . With this gIthArtha sangraham translation is concluded. upadhEsa raththina mAlai – pAsuram 6 – http://divyaprabandham.koyil.org/index.php/2015/12/upadhesa-raththina-malai-6/ – English translation by raghurAm swamy. Full series at http://divyaprabandham.koyil.org/index.php/2015/11/upadhesa-raththina-malai/ . 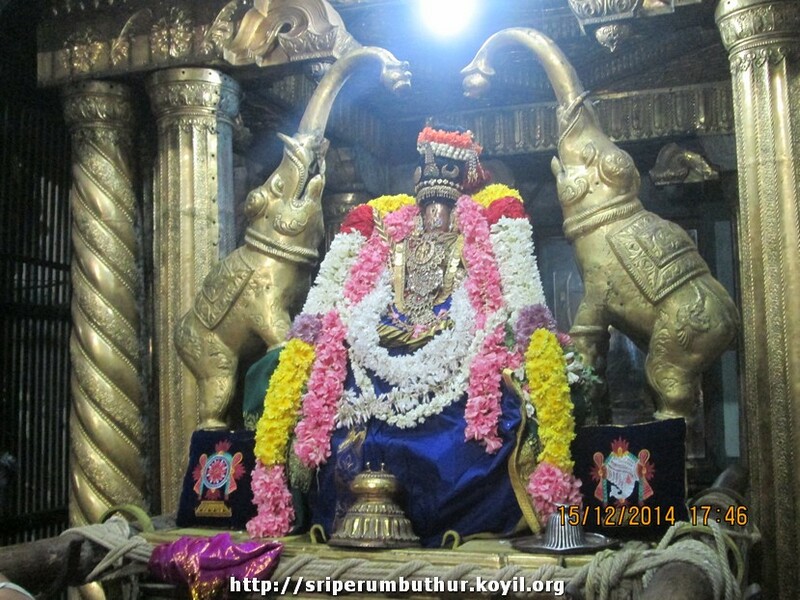 SrI dhEvarAja ashtakam – thaniyans English translation by vangIpuram satakOpan swamy – http://divyaprabandham.koyil.org/index.php/2015/12/sri-dhevaraja-ashtakam-thaniyans/ based on http://divyaprabandham.koyil.org/index.php/2015/12/sri-dhevaraja-ashtakam-tamil-thaniyans/ . Full series can be viewed at http://divyaprabandham.koyil.org/index.php/2015/12/sri-dhevaraja-ashtakam/ and http://divyaprabandham.koyil.org/index.php/2015/12/sri-dhevaraja-ashtakam-tamil/ . Audio rendering of this prabandham can be listened at http://divyaprabandham.koyil.org/index.php/2015/12/sri-dhevaraja-ashtakam-audio/ . gIthArtha sangraham – Section 7 – http://githa.koyil.org/index.php/githartha-sangraham-7/ . Full series can be viewed at http://githa.koyil.org/index.php/githartha-sangraham/ . Also, full rendering and individual SlOkams audio can be listened from http://githa.koyil.org/index.php/githartha-sangraham-audio/ . dhivya prabandham – SrI dhEvarAja ashtakam – Commencement of English translation by vangIpuram satakOpan swamy – http://divyaprabandham.koyil.org/index.php/2015/12/sri-dhevaraja-ashtakam/ based on simple explanation in thamizh by nyAya vidhvAn dhAmal vangIpuram pArthasArathy aiyengAr swamy http://divyaprabandham.koyil.org/index.php/2015/12/sri-dhevaraja-ashtakam-tamil/ . Audio rendering of this prabandham can be listened at http://divyaprabandham.koyil.org/index.php/2015/12/sri-dhevaraja-ashtakam-audio/ . gIthArtha sangraham – Section 6 – http://githa.koyil.org/index.php/githartha-sangraham-6/ . Full series can be viewed at http://githa.koyil.org/index.php/githartha-sangraham/ . Also, full rendering and individual SlOkams audio can be listened from http://githa.koyil.org/index.php/githartha-sangraham-audio/ . dhivya prabandham – upadhEsa raththina mAlai – pAsuram 5 – http://divyaprabandham.koyil.org/index.php/2015/12/upadhesa-raththina-malai-5/ – English translation by raghurAm swamy. Full series at http://divyaprabandham.koyil.org/index.php/2015/11/upadhesa-raththina-malai/ . gIthArtha sangraham – Section 5 – http://githa.koyil.org/index.php/githartha-sangraham-5/ . Full series can be viewed at http://githa.koyil.org/index.php/githartha-sangraham/ . This entry was posted in Uncategorized on December 6, 2015 by Sarathy Thothathri.